For those aware of our contest to name our blog, the winner is Lisa P., who has also helped us tremendously with the WordPress tool. With her help, the blog is now up and running. Sincere thanks to you! There were many clever submittals but her submittal felt right for our trip. She submitted the “wine”ding road” which we tweaked only slightly to R”wine”ding road. For the purchase of the blog name, it had to be http://www.rwinedingroad.com. Finally, after taking too many months to sell out home, completing the final upgrades on the RV and becoming official South Dakota full-time RVers, we left CT on 3/25/16 almost six months after our anticipated leave. We have been delighted that Uma, our 9-year old Sheperd, is a great traveler! She loves all of the new smells and isn’t a barker so can stay in the RV when the temperature is agreeable and we can’t take her with us. We have been able to easily day-board her when needed and she even loves that. What a huge relief for us that she is enjoying the ride. However, she has taken over one of our couches as her own. We are okay with that since the leather couch is easier to clean off the dog hair than our other couch which would be a magnet for dog hair. Kenny’s upgrades (with help) have paid off. The new floor is easy to clean (thanks Dan), the roof looks snappy and we won’t have to worry about any leaks anytime soon (thanks Bill, Brett, Kari, Jackie), new TV set-ups give the interior a definite upgrade and take up so little space (thanks Aaron, Nikki, Dan), and another thank you to Herbie and Patty for their overall support during all of our preparations for this trip. The RV is running well and we will keep our fingers crossed that we won’t have any major issues moving forward. Love, hugs, and kisses to our wonderful children and their spouse/significant others, our amazing grandchildren and strong support of our extended family and friends that made us feel that this trip is one we deserve even though we will all be separated for some time. We think of everyone everyday and have our sappy, crying jags regularly missing all. But we know now is the time to be selfish. We both have our health and are happy for it. Thanks to all for your support. This initial blog will be wordy, but in going forward we hope to give you some insight to our trip but also provide you with information you’d like to know so please send us comments or questions you may have. To date we have been traveling pretty much on a whim traveling down the East Coast visiting friends and family. We are currently in FL where we will tentatively plan our year while we are here so stay tuned. On our journey to FL, we stayed in Virginia Beach. While there, we stayed in an amazing KOA campsite. Of note, there are jets flying overhead all day with crazy maneuvers and the noise runs from 9 am until 9 – 10 pm. Regardless, we loved it – so much fun to watch pilots having so much fun. During this time we organized the RV more but did have some fun biking and hiking. At Back Bay Wildlife Refuge, we took a boardwalk hike and the following day went biking with a picnic lunch on the beachfront in Virginia Beach. Of the time in Virginia Beach, we enjoyed most our hike in First Landing State Park. There were very few people around and with Spanish Moss draping gracefully from the trees we passed, it felt so magical and surreal. Colonial Williamsburg was worth the trip. A must if you can fit it into your vacation plans. So much history, it was much like Sturbridge Village on steroids. Check student vacations and stay away from summer, if possible. It has become somewhat commercialized in the last five years, from what we understand. We imagine that during the summer all areas we visited would be completely, crazy, overcrowded. Regardless, we have now added Virginia Beach to our bucket list. We’d love to stay on the beachfront with our entire family. We’d provision for our time there just like a boat trip and never leave the property. The beach is spectacular but traffic would be horrible during the best season! Best to provision and stay put. We just left St. Augustine which was founded in 1565 and the history is so fascinating. So much to see and do for any interest. We suggest that you take the full trolley ride then determine what you wish to see. We took in the fort and the fountain of youth as well as some of the museums. While visiting the Fountain of Youth, we drank water from the Fountain of Youth. Alas, we still woke up with our wrinkles. Today, we moved to a beachfront RV park in Flager where, for the next seven days, we are perusing our RV travel magazines, sipping cool alcoholic drinks, watching FL sunsets, having glorious campfires and mapping our next stops on Rwinedingroad. We don’t know yet how our blog will evolve but if you are a future full-time RVer or travelling cross county, or want to know prices of places we stay, or issues we’ve had to address or can offer your suggestions of places to see or things to do in any areas we are moving to, we’d love to hear from you. We have a new contest for anyone interested. MaryEllen M gave us a Travelocity gnome and he’s travelling with us. You will see pictures of him as we travel along. He’s like the gnome in the movie Amelie but smaller. Desperately, he needs a name. Any suggestions you provide will be considered. There are no monetary awards for naming him, just bragging rights and our acknowledgment on this blog. We look forward to hearing from you. He wasn’t feeling well on our trip to Williamsburg or St. Augustine but he’s now on the mend. When we post where we are headed, we’d love your suggestions of places to visit, restaurants, hiking or biking trails, anything at all that you think we’d enjoy on our journey. Until next time, we lift our wine glasses to you and make a toast. May your best of today be your worst of tomorrow. 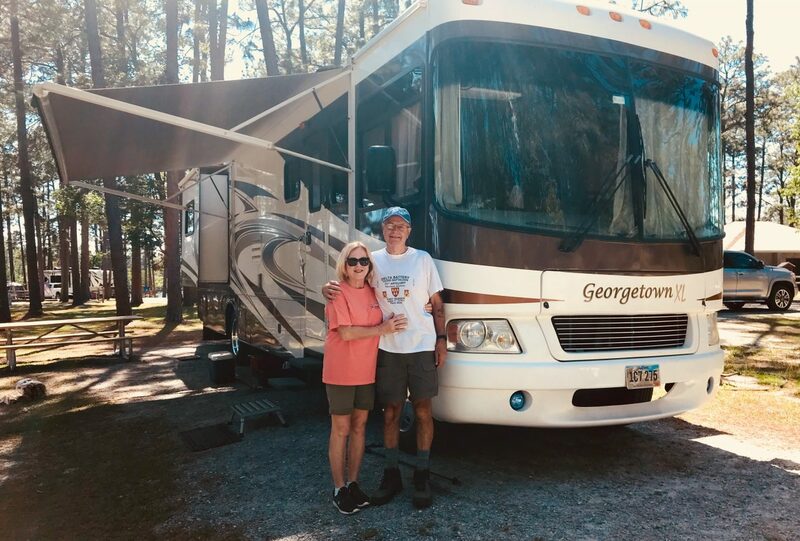 “If we don’t smell like a campfire in the morning, we are doing something wrong.”~ Ken PetersonWelcome to US National Park Adventures with Ken & Deb!